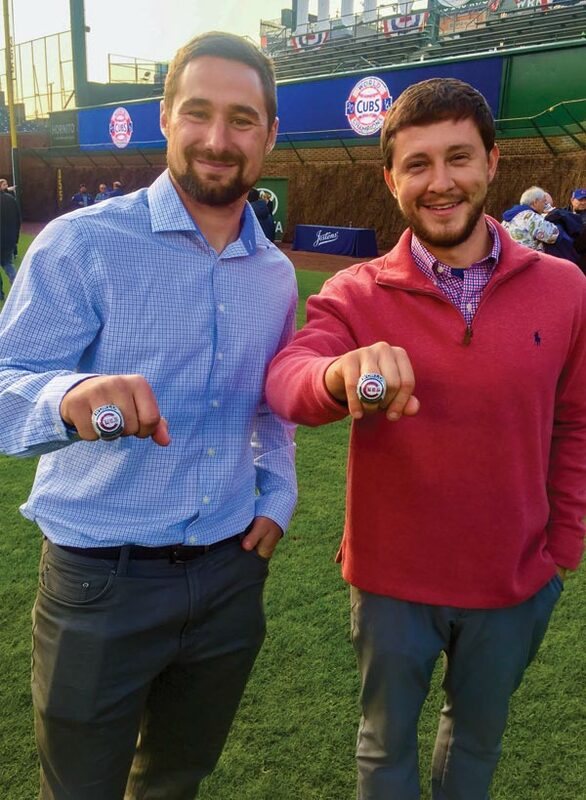 Dan Kiermaier (L) (BS ’12, turf science) and Ben Baumer (R) (BS ’14, turf science) display their 2016 Chicago Cubs World Series rings. Kiermaier and Baumer, who both have the title “Groundskeeper 1,” keep Wrigley Field in top condition for the team, a dream job made even sweeter with the end of a 108-year World Series drought for the Cubs. Both are starting their third season as Wrigley groundskeepers. Kiermaier first visited the stadium in 1998, when Cub Sammy Sosa battled Mark McGwire of the St. Louis Cardinals for baseball’s home run record. He worked at the University of Michigan athletic fields before finding his way into Major League Baseball through a position at the spring training home of the White Sox and Dodgers and a youth academy for the Cincinnati Reds. Baumer worked at Brownsburg Community School Corporation in Indiana before landing with the Cubs, where one of his key responsibilities is managing the pitcher’s mound. A sports fan all his life who loves being outside, he says working at Wrigley is the perfect job. The Certificate of Distinction is the highest award of the Purdue Agricultural Alumni Association. It recognizes those who have contributed significantly to agriculture, forestry, or natural resources through professional accomplishments, activity in professional organizations, and community service work. 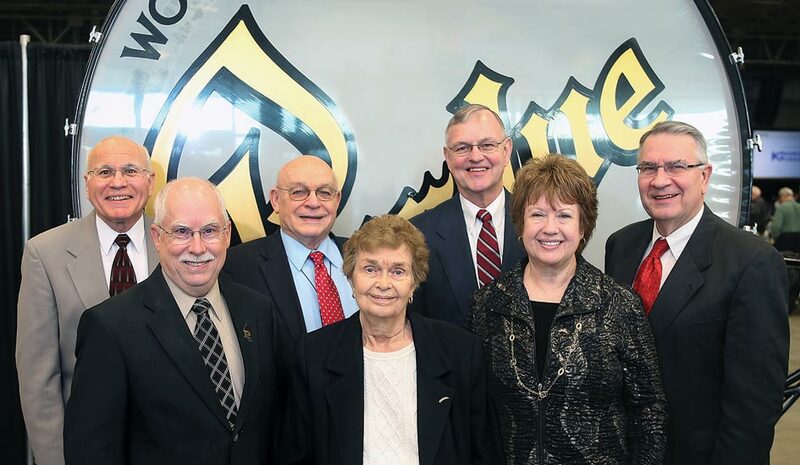 The Agricultural Alumni Association presented the 2017 Certificate of Distinction to seven honorees, pictured left to right: Robert D. Culler of Avon, IN, a leader in the retail meat and food industries who now leads Culler Consulting LLC; Donald J. Biehle of North Vernon, IN, who retired in 2016 after managing the Southeast Purdue Agricultural Center for 39 years; Dean Eppley of Wabash, IN, a leader in Indiana’s corn industry who led the drive for a state corn checkoff passed by the Indiana Legislature; Virginia R. Ferris of West Lafayette, IN, Purdue University professor of nematology, systematics, and molecular biology in the Department of Entomology; Tom Wiltrout of Plainfield, IN, who retired from Dow AgroSciences in 2014; Janet S. Ayres of Delphi, IN, a Purdue University professor and Extension specialist in the Department of Agricultural Economics; and Chris Hurt of West Lafayette, IN, Purdue University professor of agricultural economics. The Distinguished Agriculture Alumni Awards recognize mid-career alumni of the College who have made significant contributions to their profession or society in general and exhibit high potential for future professional growth. The Agricultural Alumni Association honored eight alumni with the 2017 award, pictured left to right. First row: Douglas C. Needham (BS ’77 Biological Sciences, MS ’84, PhD ’89 Horticulture and Landscape Architecture); Jane L. Lavey (BS ’92, Biochemistry and Food Process Engineering); Amy Kelsay (BS ’98, Animal Sciences); and Anthony S. Davis (MS ’03, PhD ’06, Forestry and Natural Resources). 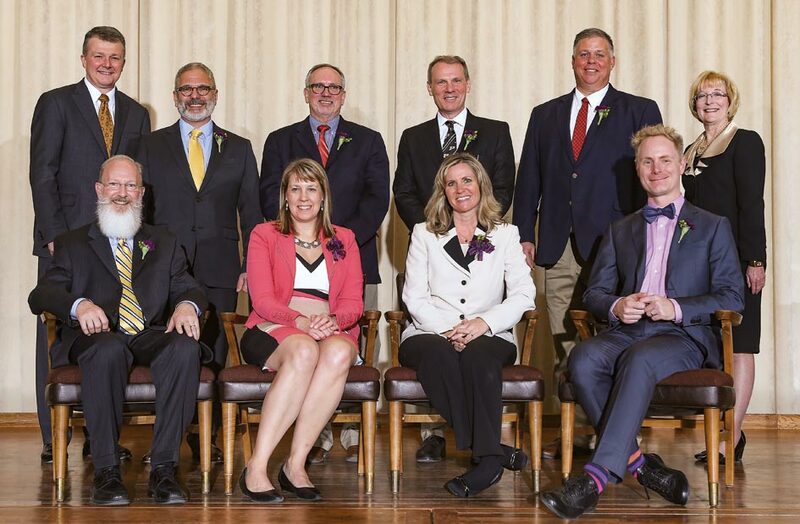 Second row: Jay T. Akridge, Glenn W. Sample Dean of Agriculture; George P. Abide (PhD ’92, Food Science); Robert J. Deschenes (PhD ’84, Biochemistry); Scot A. Ortman (BS ’85, Agricultural Economics); Christopher J. Voglewede (BS ’87 Agronomy, MS ’91, PhD ’99, Entomology); Donya Lester, Agricultural Alumni Association Executive Director. Nomination guidelines and forms for 2018 awards are also available on the website; applications are due September 11, 2017. Photos provided by Dan Kiermaier and Tom Campbell.